It’s the end of July and I have decided to harvest our sweet onion crop. I have been pulling out individual white globe beauties for weeks now. Using them in all kinds of recipes, some cooked and some raw preparations. 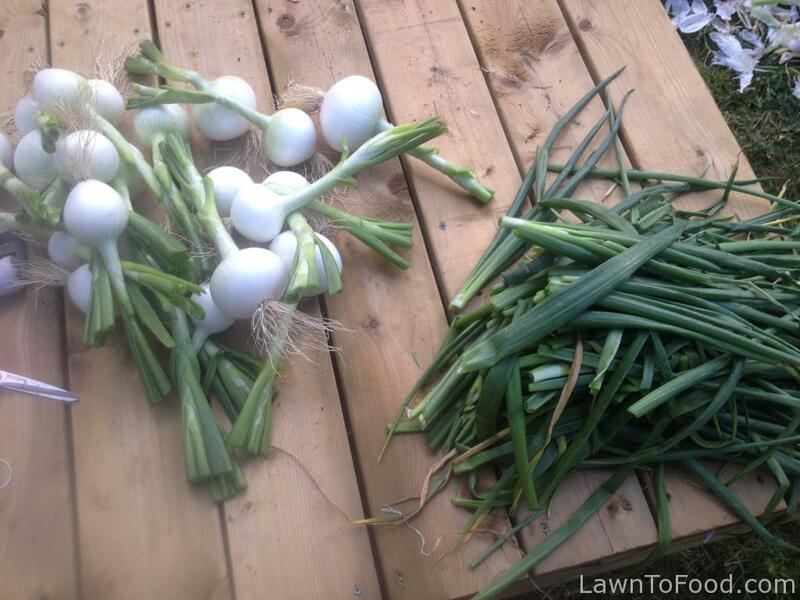 The mild flavour of these Walla Walla onions makes them one of my favorite summer foods. I purchased seedlings bundles early in the spring. Then I carefully separated the little “blades” and transplanted them into rows 4″ to 6″ apart. I mingled double rows of onions, between broccoli and kale plants and then dusted the whole area with Rainbow carrot seeds. At this time of year the broccoli is done, now the onions are coming out to cure, so the carrots will have plenty room to mature. 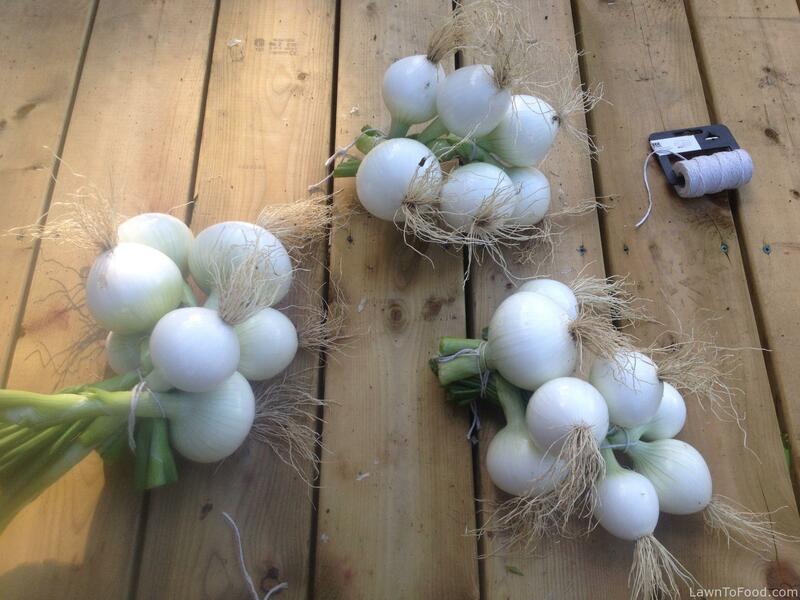 Here are some of the harvested onions on our front deck. It rained the night before, so the onions were wet and muddy. I gave them a quick rinse with the hose, and then moved them out of direct sun to dry in the breeze. 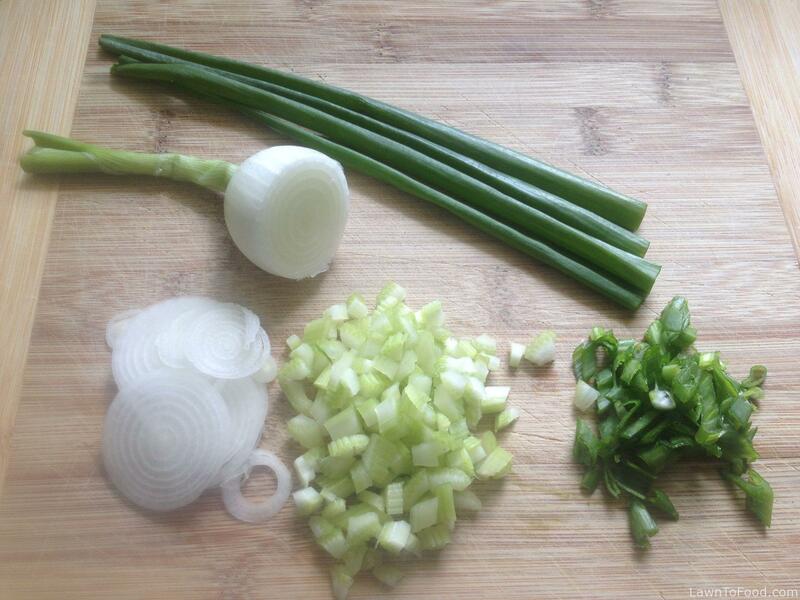 I used this small sweet onion, both the white rings and the green tops in our lunch time meal. Later in the day, when the onions were dry, I brushed the remaining dirt off of them with a soft towel. Trimming excessive green stalks off the bulbs, will make it much easier for me to braid them into bundles. Almost finished! Bundles of 8 or 9 onions are ready to hang in our carport to dry, and cure, in the summer breeze. Any onions that had nicks or marks, I move to a separate pile for us to use up as soon as possible. 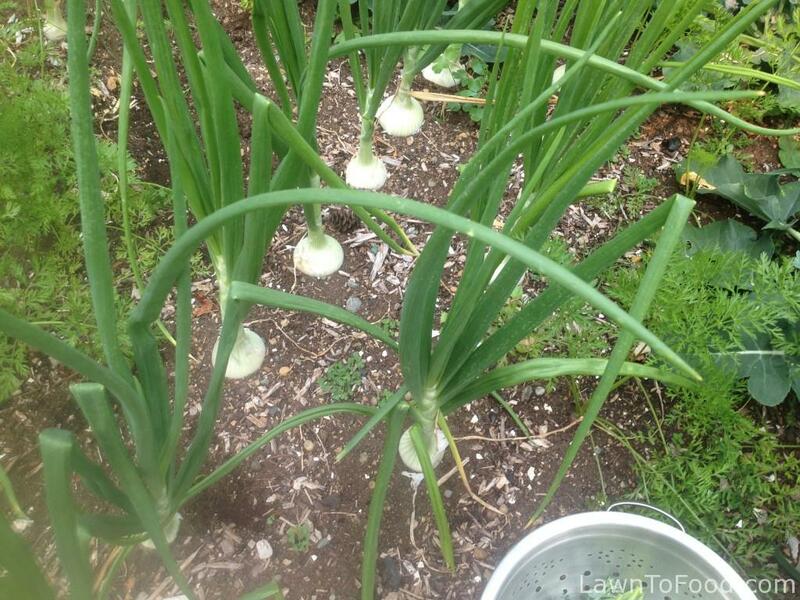 Damaged onions will spoil quickly, and it would be a real shame to waste them. I used the onion tops to mulch around our new kale starts. This young kale will grown up and supply us with curly leaves throughout the winter months. 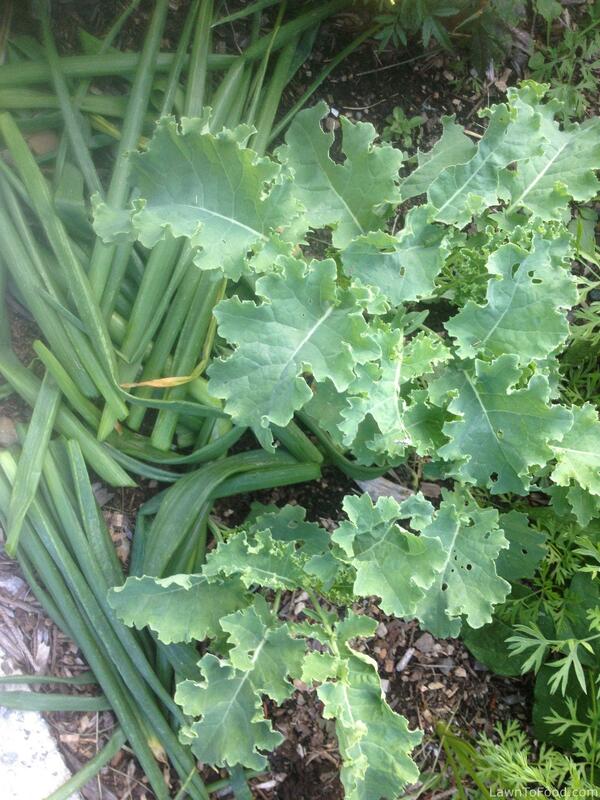 Baby kale can use all the help that I can provide, to protect it from summer pests, who love to munch on tender greens. Hopefully, the onion aroma will deter them! 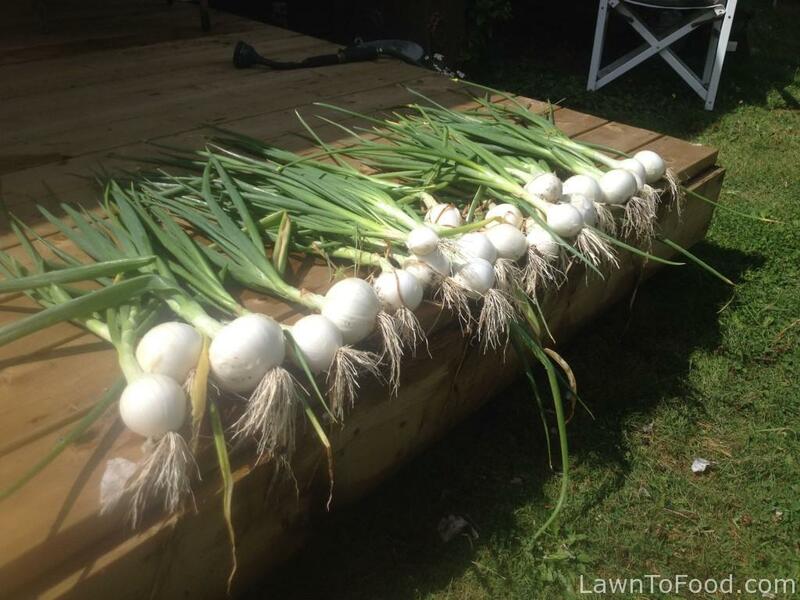 Do you grow onions from seed, seedling or sets? Join our conversation on the Lawn to Food Facebook page! Ours are almost ready to come out! 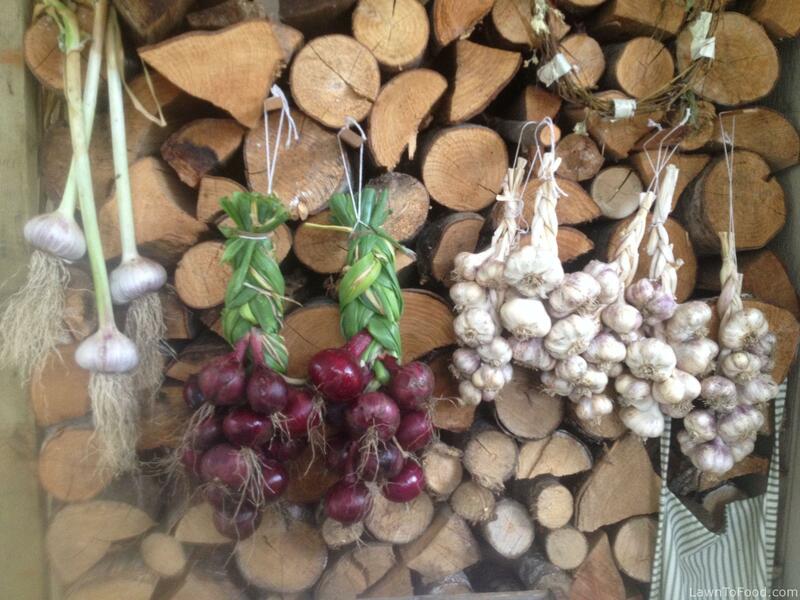 Is it too late for a second batch of onions to be planted from bulb?